31 January 2013: The 2012 class of the Engen Maths and Science Schools (EMSS) achieved an impressive pass rate of 90.3%, beating the national average pass rate by 17.4%, again proving the success of this private sector initiative to help learners achieve good maths and science matric results across four provinces in South Africa. “Engen is once again proud and delighted to have given so many bright young people the chance to pursue their dreams of working in the maths- and science-related fields. We are proud of the Class of 2012 and wish them all the best in their upcoming studies and careers,” says Khanyisa Balfour, manager of Corporate Social Investment (CSI) at Engen. EMSS is a national initiative that aims to assist learners, who show potential and interest in the maths and science fields, with extra tuition to pass matric maths and science, and potentially qualify for further education and training, as well as skilled employment. The programme seeks to address a key skills shortage in the engineering and technical fields in South Africa, and to provide sustainable solutions for Engen’s neighbouring communities. The EMS schools initiative assists learners from Grade 10, 11 and 12 through highly skilled teachers, supplementary educational material and by providing learners with extra academic support. About 2 000 learners a year from Grades 10 to 12 participate in the EMSS per year, of which a total number of 754 EMSS learners wrote the Grade 12 NSC in 2012. Engen recently opened its newest EMS school in KwaZulu Natal, at Ganges Secondary School in Merebank, which brings to nine the total of maths and science schools positioned strategically at higher institutions across the country. 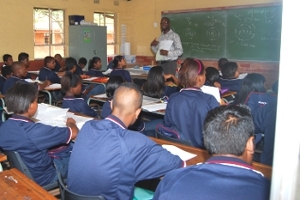 Engen also has classrooms at Zakariya Park Secondary in Gauteng, the Cape Peninsula University of Technology in the Western Cape, the Mangosuthu Institute of Technology in Umlazi (Mantech), KwaZulu-Natal, the University of KwaZulu-Natal (Howard Campus), Fairvale Secondary School in KwaZulu-Natal, Nelson Mandela Metropolitan University in Port Elizabeth, University of Fort Hare in East London and Cala High School in the Eastern Cape. The top learner in the EMSS Class of 2012 is Tevin Richard of Merebank, who scored 98% for science, 91% for math and 89% for English. He obtained 8 distinctions overall and will be studying Chemical Engineering at Howard College, UKZN this year. The other top students in the top 3 includes Virgil Earl Marais from Merebank, who scored 96% in science, 91% in math and 86% for English and Bassie Nkhereanye of Grosvenor Boys who achieved 88% for science, 85% for math and 87% for English. Virgil is applying to study Computer Engineering in the United States, while Bassie wants to study teaching. Since the initiative was launched 26 years ago, it continued to produce quality learners, many of whom have pursued studies in fields such as engineering and medicine. 2012 was no exception as the EMSS again consistently outperformed the provinces where they are located. The Western Cape had a pass rate of 82.8% while the EMSS in the province had a pass rate of 88%. The classes at Cala, Nelson Mandela Metropolitan University and Fort Hare in the Eastern Cape had pass rates of 71%, 100% and 100% respectively, all well above the provincial pass rate of 61.6%. Gauteng’s pass rate was 83.9%, while the EMSS in Gauteng had a 100% pass rate. In KwaZulu-Natal, the EMS schools at Howard, Fairvale and Ganges, as well as Mantech had pass rates of 91%, 96%, 92% and 75% respectively as compared to the KZN pass rate of 73.1%. The EMSS learners achieved a total of 90 distinctions with 26 being achieved in Mathematics, 35 in Physical Science and 29 in English. This excludes Mantech distinctions as data is still being compiled. While the national rate for learners who attained a Bachelors pass (allowing them to go to university) was 26.6%, 60.3% of the EMSS Class of 2012 can go to university. The EMSS pass rate dropped by 6% from 2011 to 2012, due to the introduction of new poorly performing schools as identified by the district administrations in Cape Town and East London to the programme. There was also an influx of new students thanks to the new school in Ganges, and new learners being placed in the Grade 12 class, who were not part of the programme for the full three years. Balfour said some of the learners in the programme had to overcome great socio-economic challenges to achieve their high results. “Their success is testament to the fact that hard work and perseverance, and the support of committed teachers, pay off. At Engen we are passionate about maths and science education in South Africa and recognise its importance in producing a prosperous, skilled work force in the country. “Engen’s drive to help graduates develop stimulating careers not only benefits these young people’s lives, but the economy as a whole. We strongly believe that it is our corporate social responsibility to help young people with potential to overcome obstacles and break the cycle of poverty in the country,” says Balfour. Although Engen employs private teachers for its EMSS initiative, it works closely with the Department of Education to ensure that their teaching complies with national standards in maths and science tuition.